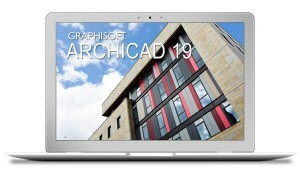 GRAPHISOFT leads the BIM revolution with innovative design solutions including ARCHICAD, BIMcloud, and BIMx. Label-hysteria! It all looks the same!? Label-mania! Where does your data live? Label-insanity! How do I show all the Data? He is absolutely correct. Unification of aesthetics is the feature that completes Labels in ARCHICAD 19—and it’s the feature that any custom made Label must have. For centuries we have praised the magic of poché—the ability to turn disparate parts of a drawing into a pleasing simplification. The Label tool offers a similar solution for masking the specifics and origin of text based information. My previous two label posts focused on the input of the data. Is the data linked and automated? What Label will show the data? But input is only half the challenge. Once we have collected all this data, or figured out where it lives, it’s time to display it. Put another way, it’s time for output. ** Linked, automatic data in a Label doesn’t look special. And that should be the goal. It looks like any other piece of text. When your boss, contractor, or client sees the label or leader, they won’t know how special and impressive it is. There are so many wonderful things to like about the new and improved Label Tool in ARCHICAD 19. When we look at output, the killer features of the new Labels are that when you switch between Label types the graphics are maintained, and you can use the same Label on any element type (Favorites aren’t specific to a particular Tool type, like they were in the past). You can eyedropper a placed Label without worrying if it’s the same Label as you need; you can always switch to a different one, and not mess up all your arrow sizes, pens, font choice and size, etc. You can start with a Label with a leader showing a window size and then switch to another Label type that shows the ID of a slab. This means you can cycle through all the labels and pick the data set that works best for you. This allows you to BIM faster. If you don’t believe me about how amazing this is, go back to ARCHICAD 18 or earlier. Switch between Label types and watch all the graphics get messed up. It’s no wonder most of us hardly took advantage of the Label tool until now. We need uniformity of aesthetics across not only drawing types, but also data sets. A leader pointing to a wall should look the same as a leader pointing to a window. 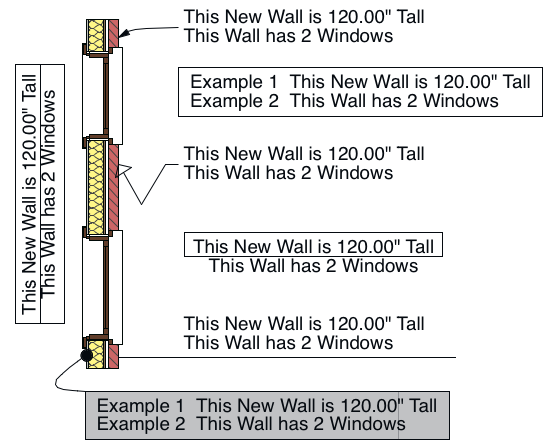 Text showing what the siding is should look the same as text describing the ductwork. This is important because if there isn’t a common graphic standard then there will be an increased chance of miscommunication. Or let’s be honest. It’s not just about communication. It’s also about design and personal preferences. Designers and architects are particular. We fret about the most foolish things: the distance between the leader and the first line of text, the relationship of the leader to the different rows of text, whether helvetica or avenir looks better, should the text be ALL CAPS, sentence case, or Title Case… And if we can’t control these things we get grumpy. And then we don’t use the smartest tools because it has to be the way we want—often the way we manually did it in the past with previous tools (or ancient versions of ARCHICAD). Here are the sixteen different default Label Types from the Label Tool. I’ve done my best to make them all look as similar as possible. As you can see, you can get things very uniform. Had I turned off some parameter names, I could have made them even more similar. But I thought some differences would help you see the similarities. While it’s important to show data in a similar manner, it’s also helpful to have differentiation. Sometimes you want a group of notes to read different, even if their back-end origins are the same. For instance you might want certain text highlighted on a site plan, or some wall description (pulled from a few IFC parameters or the skin list) to look especially unique. Here is the Tags and Categories Label 19 shown in eight different ways. If there was more data shown, I could have pushed the differentiation a little farther. But I think it’s more helpful to see less data, as that is what you’ll typically see in a note. The automation provided by the new Label functionality along with various display options, makes for a powerful tool. Labels in ARCHICAD 19 need to be something you use. I hope you already see that by now. But it needs to be said. The Label tool might not give you perfect aesthetic control, but it gives you a huge range of solutions. Whether you are adding uniform or unique annotation, you should be able to accomplish it with an automated Label. Don’t assume that because what you are doing is some fancy, one off call out, that you need to do it the old manual way. You don’t. If you can’t find the visuals you need within the Label tool options, then you are trying too hard to be special. Look at the graphic features of the Labels and find the combination that looks best to you. Accept the automated beauty it offers. The advantages of these labels are just too great to get hung up on something little and inconsequential. And if you get into an argument about this with a coworker, do some quick math. Mention how much more time their non-automated solution will take. Then ask them who will cover that cost. Label-obsession! Describing everything from Day One! Are you following Graphisoft North America on Twitter? Click Here to keep track of all the latest ArchiCAD News in North America (and beyond). **In this series of articles we are just talking about how to get data into elements and then display it on drawings. This is all just preamble. If we are linking and automating data for our drawings (which we need to do today), we are also getting that data ready for export via IFC model exchange and for viewing in BIMx.